Aqua Alta Policemand Pedestrian Traffic November 1966: Imagine Venice immersed at 100 % by two metres of water! But truly, Acqua Alta has nothing to do with “the sinking” of Venice, which certainly is true but of less than a millimetre a year. As for the weather, high tides forecast is quite difficult. 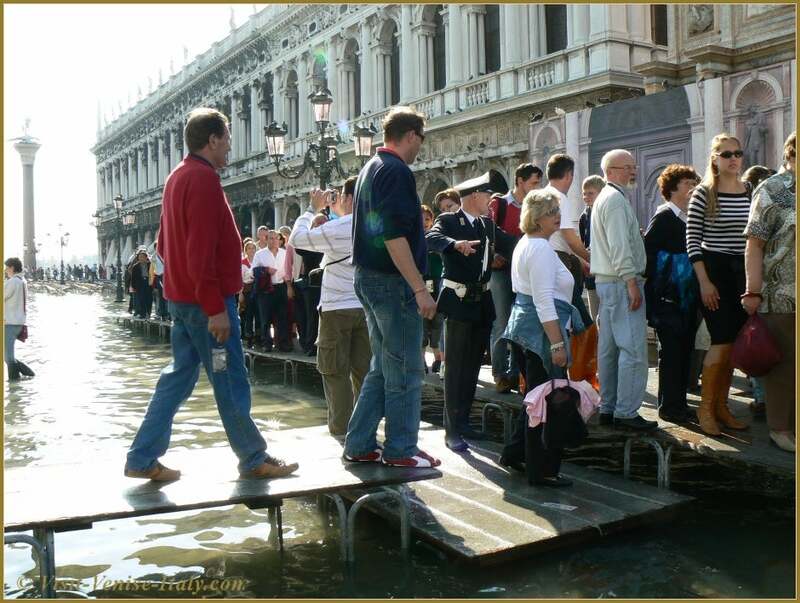 As a result high tide, Acqua Alta forecast can be at maximum for 4 or 6 days in advance, and it can even change in the last hours. Level 1.10 metres: One long sound. Level 1.20 metres: Two crescendo sounds. Level 1.30 metres: Three crescendo sounds. Level 1.40 metres: Four crescendo sounds. Percentage of Venice that will be under water for different tide levels. 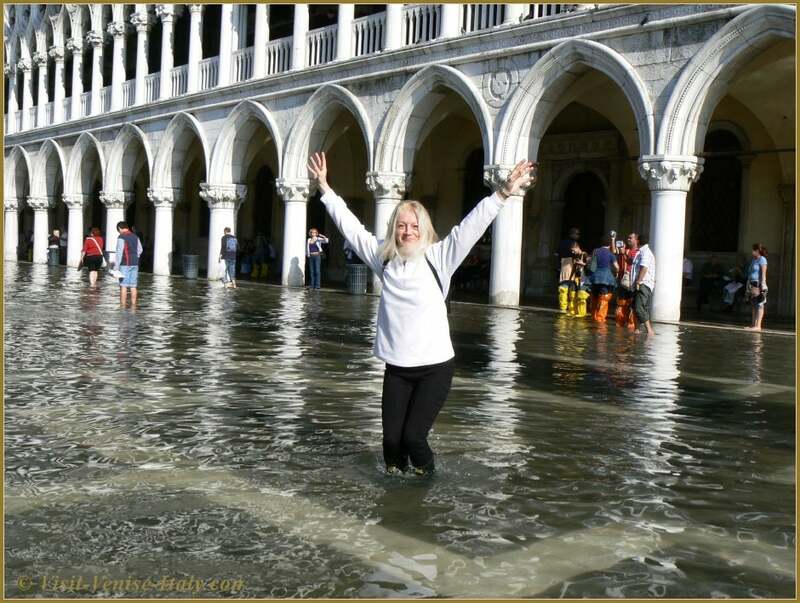 Warning: "Under water" begins at one centimetre of water covering the ground, meaning that in the following table, some parts of Venice can be under 10 centimetres of water while for others it will just be a paddle like after the rain! Acqua Alta Saint-Mark Square Venice Certainly, over last century, Venice sank about 10 centimetres, due to industrial groundwater extraction but largely stopped when artesian wells on the mainland were capped in the 1960s. Acqua Alta, what is it? Then it is what? Acqua Alta occurs when certain events coincide; the high tide forms an alliance with low pressures and that their windy friend, Sirocco, participates with our friend the Moon. These elements together trigger the across-the-board flood of waters of the lagoon in Venice. History is true and arrived at Igor Stravinsky the Acqua Alta had been then so high as the compositor could no longer return to his hotel. The concierge of aforementioned hotel Bauer, took Igor Stravinsky in his arms and carried him indoors. It was after this Acqua Alta that Igor Stravinsky writes “The Flood”! The biggest problems Acqua Alta poses, at most some centimetres of water in calli (streets) which gives them a glistening aspect, is getting the camera quickly! Besides, you will be warned in case of serious Acqua Alta. Sirens (which still date to the last world war), will shout a warning signal. If you are surprised in the city without Wellington boots, the dealers will be delighted to give you plastic bags for makeshift boots to make waiting better! The period at risk is from September 15th till April 15th every year. If you think to visit at this time of the year, it is best to be prepared with a pair of Wellington boots and enjoy the pleasure, as the children, of walking in the puddles! It is a big “Pharaonic” plan of the installation of seawalls to try to check the phenomena of Acqua Alta by installing in the entries of the lagoon (in the channels of Lido, Malamocco and Chiogga) 78 floating seawalls on about 1600 metres and divided in four chunks with huge hatches that can close up or open according to the whims of the tide. The estimated cost is of 5,5 thousand million euro more about 35 million euro of expense of annual maintenance. It should be done by the end of year 2020.